The metallic components like scrap, bales, pig iron and foundry retains are stored in the hopper. The hopper shape is specially designed to enable bulky and irregular scrap pieces to be extracted without problem. Vibrating furnace charger is effective solutions to problems such as high labor cost, hazards operators faced in foundries, melting shops etc. Such a kind of automation allows foundry men to work at a safe distance thus preventing injuries arising out of molten metal splash. It also facilitates in rapid and quick charging of the furnace thereby allowing maximum utilization of the furnace, in addition to this, the damage to furnace lining is avoided which normally occurs in manual charging of the furnaces. 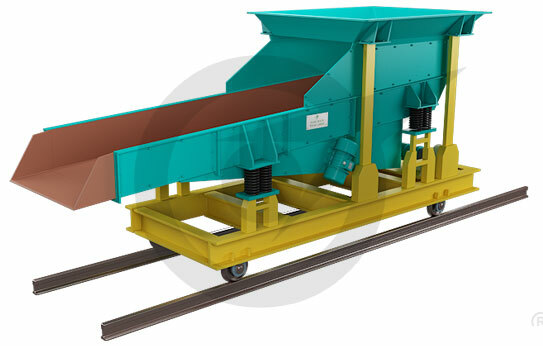 Vibrating Furnace Charger consists of a vibrating feeder mounted on a moving trolley with a storage hopper mounted above the feeder. Our company make vibratory furnace chargers basically comprise of the following parts. Vibrating Feeder suitable for delivering required capacity. Storage hopper of required capacity. Moving carriage with driving arrangement. Control panel for operating the system. Cable reeling Drum / Cable Drag Chain. The vibratory charging car on the vibrating furnace charger comprises a discharge chute with vibratory feeder for the metallic components and is hopper all mounted on the travelling framework with drive gear. The discharge snout is inclined and formed of a rounded trough to bring about a good charger distribution and enable irregular or bulky pieces of scrap or returns to be discharged. The feeder is driven by unbalanced motors. The vibration frequency can be altered by an A. C. Inverter, thereby regulating the feed velocity and also influencing the noise emission. The batch hopper as well as the charging feeder is built in sandwich construction which reduces the noise generated by contact between the charge materials and the hopper walls or feeder deck. However, this does not eliminate the noise produced by contact between the charge pieces themselves. The required amount of scrap metal is loaded into the storage hopper at the loading point. The trolley then carries the vibrating feeder along with the storage hopper to the furnace point. Here, the vibrating feeder is energized and the material is effectively discharged into the vibratory furnace as per the required capacity. As the metal is melted down, fresh batch of metal can be fed into the furnace thereby keeping the furnace full. The capacity of the vibrating feeder can be varied by varying the amplitude of variations. The amplitude of vibrations can be varied by adjusting the position of centrifugal weights or by using a variable frequency drive (optional). A control panel specially designed to suit individual client requirement depending on the sequence of operations required is provided. Star Trace vibrating furnace charge feeders and charge systems give you precise automated batch control, optional scrap drying and other charge enhancement capabilities. Equally important, automated systems help improve worker safety. Charger nosepiece is designed specifically for your furnace to control fumes and direct the charge into the center of your furnace. Vibrating furnace charge systems can be motorized to move forward, backward, up, down, or transversely. In special applications, vibrating charge feeders can be fully radio controlled and independent of rails. Very fast as compared to manual of vibratory furnace thereby enabling optimum use of the melting system. Extremely controlled of material into the furnace. Prevents damage to the vibratory furnace lining since the material is properly guided into the furnace so as to avoid the material from hitting the furnace walls. No direct exposure of manpower to the vibratory furnace thereby preventing dangerous accidents due to metal splash (since the operator can carry out the operations at a very safe distance). Minimum heat loss of the vibratory furnace since the vibratory process can be maintained continuously at the required rate. The demand for high quality foundry products and their cost effective production places high demands for furnace equipments in melting plants. Though much of the initial head way made in foundry automation was with the mould making process, more important is the melt shop automation. This includes remote furnace systems. Automation is mainly thought of as a solution to high labour cost and it certainly can increase workers productivity. However, much more important today is the effect of automation on quality. Another important advantage that automation provides in foundry environment is enhanced safety. For example automation allows foundry men to work at a safe distance from molten metal or do their jobs behind protective barriers thus reducing injuries from metal splash or vibratory furnace eruption. Also where automation exercises monitoring & control functions, it helps prevent accidents related to in-attention or judgement errors. Manual vibratory also directly exposes melt deck workers to the dangers of metal splash from charge materials hitting the molten bath and of vibratory furnace eruption or explosion caused by wet or damp charger materials. Metal splash is one of the most common melt deck hazards & ideally, melt deck worker should be away from the furnace or behind protective barriers during which can only be accomplished with remote systems. Remote systems enhance safety not only by allowing melt deck worker to be away from the furnace during charging, but by reducing the chances of damage to the furnace lining & the likelihood of bridging situation. This vibratory feeder technique brings about a greater accuracy of dispensing. The metallic components are dosed either into a weigh hopper or directly into the charge bucket which stands on load cells or by lifting magnet on crane hook with digital weigh scale. The vibratory car on the vibrating furnace charger comprises a discharge chute with vibratory feeder for the metallic components and s hopper all mounted on the travelling framework with drive gear. The discharge snout is inclined and formed of a rounded trough to bring about a good charger distribution and enable irregular or bulky pieces of scrap or returns to be discharged. The feeder is driven by unbalanced motors. The vibration frequency can be altered by an A. C. Inverter, thereby regulating the feed velocity and also influencing the noise emission. The batch hopper as well as the vibratory charging feeder is built in sandwich construction which reduces the noise generated by contact between the charger materials and the hopper walls or feeder deck. However, this does not eliminate the noise produced by contact between the charge pieces themselves. Once the vibratory charger is prepared it is put into the storage hopper of the travelling charger. The charger drives from the loading point onto the furnace platform in front of the induction furnace. The furnace hood is arranged in such a way that it can be fitted for charging pouring. The vibratory furnace lid itself hangs from a chain inside the hood. The hood is raised and the charging machine drives up to the charging point and than the vibrating feeder is energised, The furnace is filled and as the contents are melted down the furnace is kept full. Various logic circuits can be designed depending on the customers requirements so as to charger multiple furnaces using a single furnace charging device.The system can also be designed so as to achieve a completely automatic cycle with time lags provided for energising and de-energising the vibrating feeder and also for providing time lag for the reversing cycle. Patented vibratory charger feeder nosepiece expands to prevent jams, fits tight to furnace hood to contain fumes and any potential splashback, and directs charger into center of furnace to reduce furnace damage. Noise reduction vibrating feeder troughs for quiet loading and unloading. Heavy duty vibratory feeder designed for 24/7, 365 operation with little maintenance requirements reduces your planned downtime. Two-mass, natural frequency vibratory charger feeder design requires very little energy to operate, reducing your energy costs.